Over the cold winter months we’ve been hard at work finalising the design and working through the build process alongside Potton’s builders, we’re very proud of the end result. 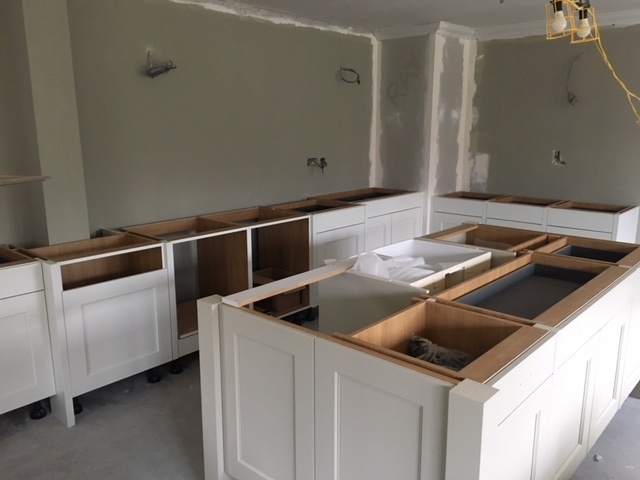 It’s a fantastic addition to our Kitchen and Bathroom Experience Centre and really showcases a different style of kitchen from the others in the centre. The Milchester house is a Georgian design, giving you that feel of a big country manor, it is critical that the kitchen design fits perfectly within the styling of the house, something which we feel it achieves well. 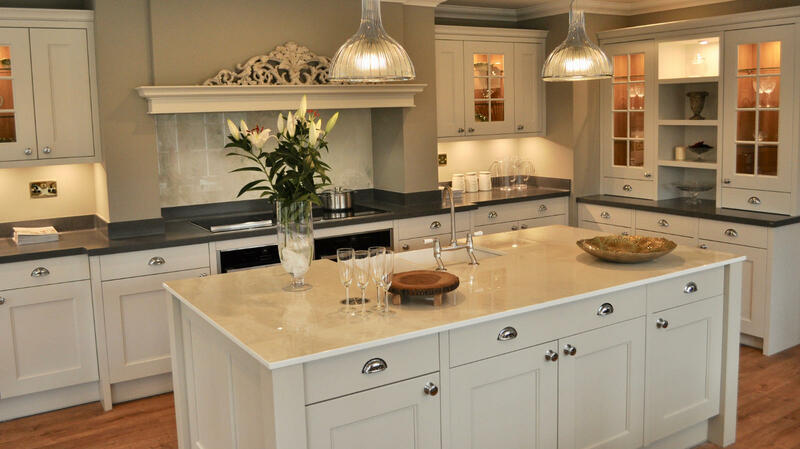 We wanted the kitchen to have a bespoke hand-made look and feel, but these kitchens are often don’t feature modern storage options and features such as soft-closing hinges and drawers So we went for a kitchen design which has all the classical styling, but features elements which give it a contemporary twist, and importantly, is practical to use. I’m really proud of the end result. The launch event was great success, despite it snowing on the day, we received a lot of great comments on the kitchen”. We worked closely with Potton’s interior designer to refine the colours of the kitchen and match them with the house. Chrome handles and taps were then added to give the kitchen a contemporary edge. The kitchen also features a chimney above the oven and hob, this was added to give a focal point for the kitchen and has the added benefit of hiding a structural steel beam. In here, the extractor fan is hidden to give the impression that the chimney is the ventilation. 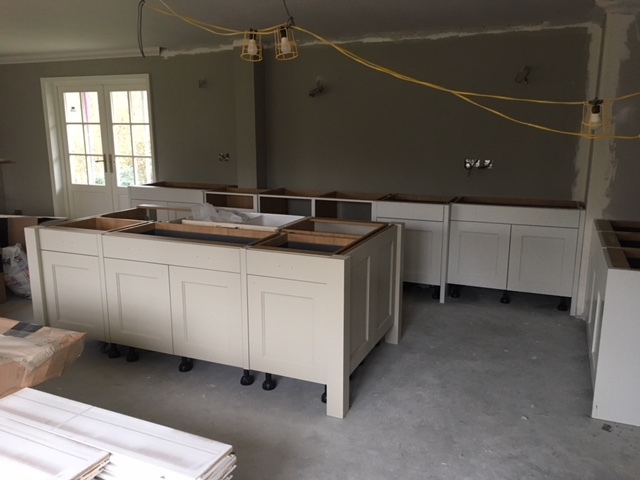 Being a modern kitchen, regardless of its classical styling, we wanted to ensure that it came complete with the best appliances possible, and we’ve certainly achieved that. Working with NEFF we’ve installed two hide and slide ovens, sitting below their latest flex induction hob. This is then complemented by NEFF’s incredible Teppanyaki cooking surface, giving you the ability to cook traditional Japanese cuisine, along with many other things. The extraction above the hob and Teppanyaki is provided by NEFF’s sleek yet powerful extractors, which has external ventilation built in from the start of the project. One key appliance which we really want to point out is the incredible Siemens fridge. This fridge is a stand-alone appliance, but it sits in-line with the kitchen units. This is made possible by hinges which enable the fridge doors to come forward and around the unit edges, which sounds obvious, but no other fridge on the market can do this. The worktops used in the kitchen, and as you’ll notice there are two separate ones, are Corrian and Dekton, highlighting the best worktop products on the market. Dekton, used on the island, is an incredible composite material which is very durable and hard wearing (see our in-depth blog on Dekton here). 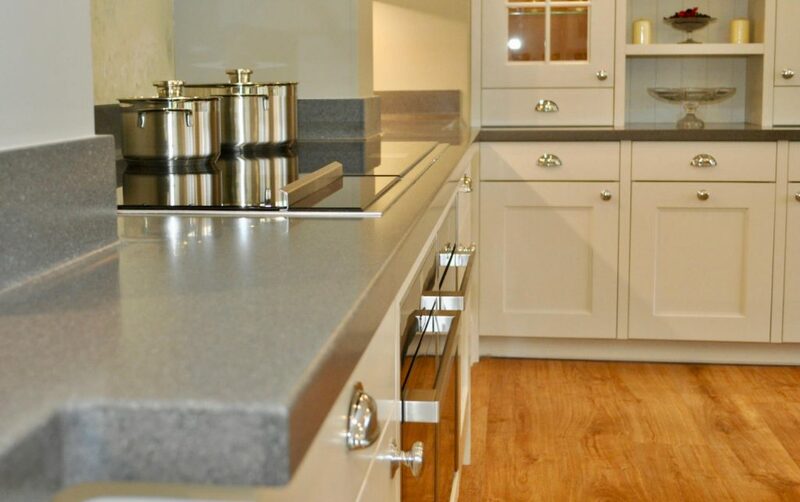 This is the worktop we recommend for customers who want something almost indestructible, although it is one of the more expensive worktop options. Corian, which we used around the outside of the kitchen, is another composite material, but isn’t quite as hard wearing as Dekton. One great feature of Corian is that installers can melt the seam of the worktop, giving you a seamless worktop finish, and any damage caused by use over the years can be buffed out. We could go on about all of the features of this kitchen, but you really need to see it for yourself to uncover all of the hidden and subtle features in this kitchen. If you’re interested in visiting our Kitchen and Bathroom Experience Centre, visit the showroom page and book an appointment with our designers.